Adam Nowak, an American assassin, has been parachuted into Poland by British Intelligence (Special Operations Executive). His mission: kill Germans and help the Polish Home Army (AK) in their fight for freedom. On 1 August 1944 the Warsaw Uprising begins. Units of the Home Army in Warsaw attack the Germans and seize control of parts of the city. The red and white Polish flag once again flies above the city of Warsaw. The Germans respond with brutal force. For Adam Nowak there is much work to be done. Natalia Kowalska, a Home Army (AK) operative, codename the Conductor. Her mission: work undercover as a railway conductor on the Krakow-Warsaw rail route so as to smuggle stolen Nazi documents to the Home Army command in Warsaw. On 6 August 1944 Natalia arrives in Warsaw to find the German SS murdering Poles. Her rendezvous with her Home Army contact is at a church in the Wola district of the city. The priest and nuns are shot by the SS just before she arrives. She delivers her documents and remains in Warsaw to fight the Germans. A hospital comes under attack from a German Panther tank. Holes are blown in the outer walls and a fire rages inside. The patients are attacked and beaten by Ukrainian conscripts. Natalia watches from a nearby building. She takes her pistol and shoots dead the tank commander. In the street she fires at an SS trooper. Another SS trooper takes aim at her. Before he can fire a gunshot rings out and he falls. The Home Army assassin, Adam Nowak, has saved her life. During the 63 days of the Warsaw Uprising Adam and Natalie struggle to stay alive. The Home Army surrenders to the Germans and Hitler orders the destruction of Warsaw. The Soviets who had watched the struggle between the Poles and the Germans from the other side of the Vistula capture a city in ruins. By May 1945 the Red Army has defeated the Germans and taken Berlin. The three powers' conference between the USSR, USA and UK has given Stalin what he wants - control of Poland. In the spring of 1940 the Soviet Secret Police (NKVD) murdered around 25,000 Polish army officers. Their crime was discovered in April 1943 by Nazi Germany. The Germans found the remains of the Poles buried in a forest at Katyn in Russia. The Soviets denied responsibility and blamed it on the Germans. Natalie and Adam learn that a copy of the Katyn Order signed by Stalin authorising the execution of the Polish Army Officers may exist in Poland. If they could find it and make it public then the US President and UK Prime Minister might stand up to Stalin and demand a free Poland. 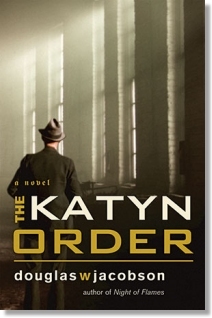 Can they find the Katyn Order before the Soviet Secret Police (NKVD) find them? The fate of Poland may depend on the answer. Publisher - Published by McBooks Press, USA, in 2011. This page was added on 19 June 2011.